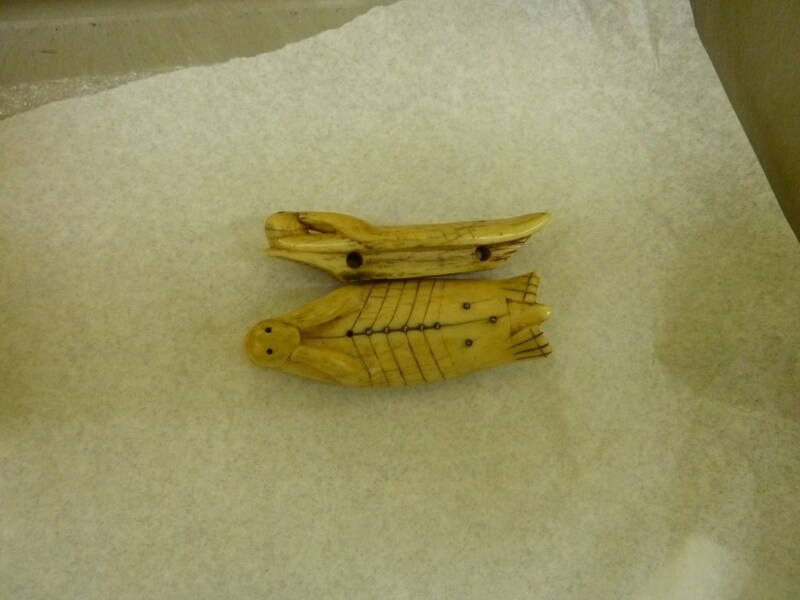 For the linguistically curious, chag^a-n (amulets) is the plural of chag^a-x^ (amulet). 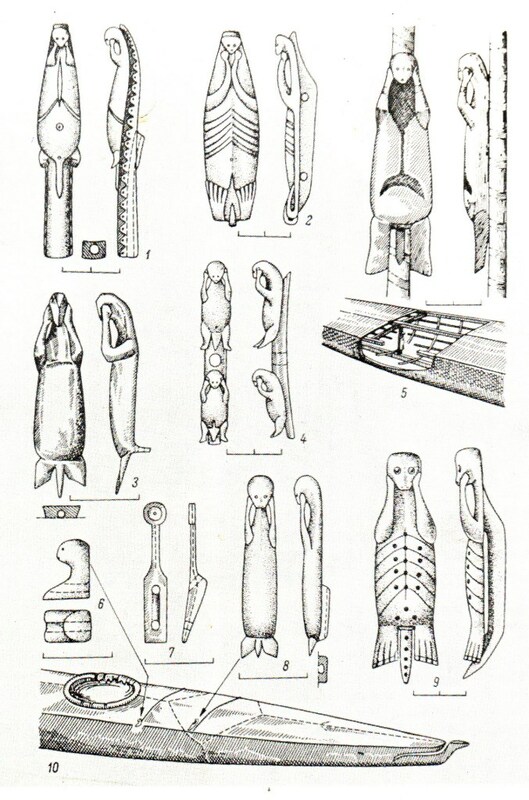 Charms and amulets probably varied quite a bit from one paddler to the next since they were probably a personal affair. What worked for one paddler would not necessarily work for the next. But let's look at some things that might have been charms. 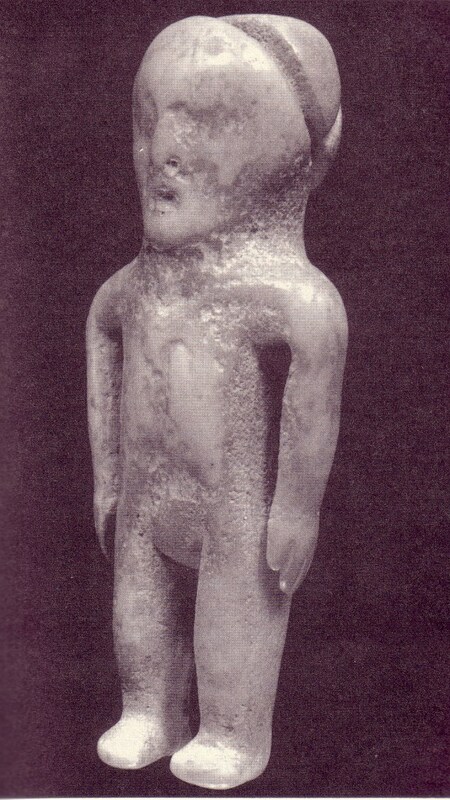 This figure is made out of bone. It may have had inserts where the holes are in the eyes, chest and the chin. The chin probably had labrets. Who knows what was in the eyes. It has also been suggested that this figure may have been attached to a wooden hat. That might explain the slanted cut on the figure's own right side. The angle of the cut would match the slope of the side of the conical hat. 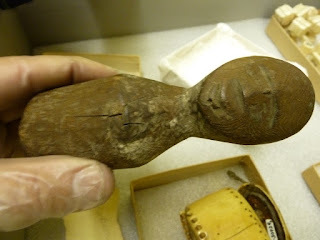 The groove around the back of the head of this fellow may have had hair attached to it with a string, or maybe it was just a place to tie a string around so it could be worn around the neck. This fellow is made out of wood. Nothing more can be said about him. Whether any of these figures were carried in ditty bags is not known. 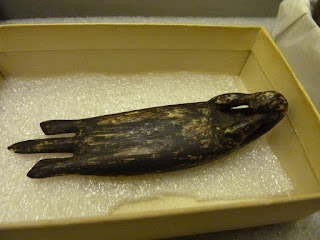 There were other carved figures about the kayak though some had practical uses like cleats at the ends of deck lines that kept deck gear like paddles from slipping off the deck. These sea otters were attached somewhere on the kayak, most likely not to deck lines but more likely to a vertical part of the kayak in its interior. 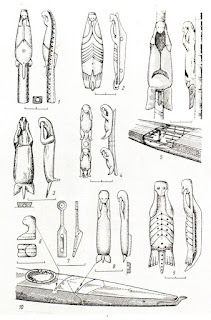 This drawing shows various otter carvings in use on kayaks some on deck lines, some not. The one on the top right was attached to the vertical brace inside the kayak that ran from the keelson to the deck stringer. Right underneath the figures is a cutaway of the deck showing the brace that maintains the distance between the keelson and the deck ridge.